To Europeans in the Middle Ages, the Devil was a very real presence in the world. Every week, they would hear that hell was a possible eternal destination for their souls and that the Devil would rest at nothing to claw them down to the pit. Tales of the enemy’s behavior spread so that people would be better able to combat his wiles. 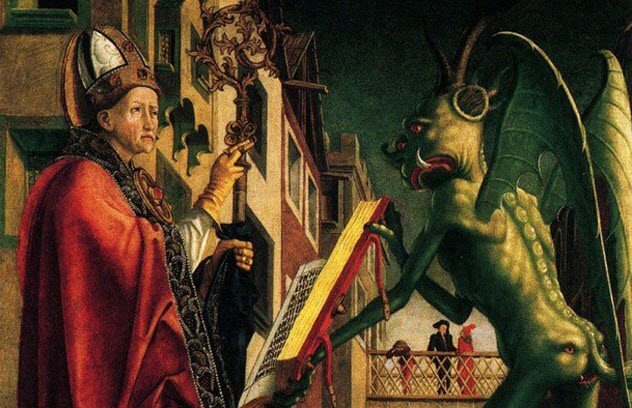 Here are 10 of the most diabolical satanic narratives from medieval Europe. 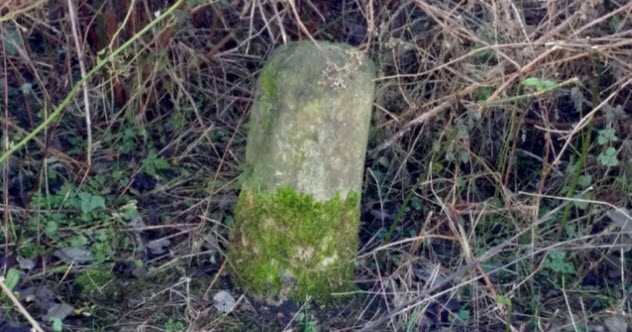 In the English village of Marston Moretaine, there is a mysterious standing stone known locally as the Devil’s stone. The origins of the stone are lost to history, but folklore provides us with the tale of how it got its name. The village church has a peculiar structure with the bell tower a little distance from the main body of the church. This unusual state of affairs occurred when the Devil, for some unknown reason, attempted to carry off the tower. Finding it too heavy, he dropped the tower in its current location. Unhappy that his mischief for the day was ruined, he cast his eyes about for some new sport and found it in the shape of three boys playing a game of leapfrog. It being the Sabbath, all such sports were banned. So the Devil decided to take his due. The boys were taking turns jumping over a standing stone—the very one which would soon become the Devil’s stone. The Devil challenged the boys to leap over him as he stood on the stone. Wanting to prove their prowess, the foolhardy boys each hopped over the Devil without waiting to see how the others had done. On the other side of the Devil and the stone was a hole in the ground leading straight to hell. The boys had plunged into this hole. Old maps show that buildings near the stone were given the name “The Three Jumps” in remembrance of the unlucky leaps of the three boys. 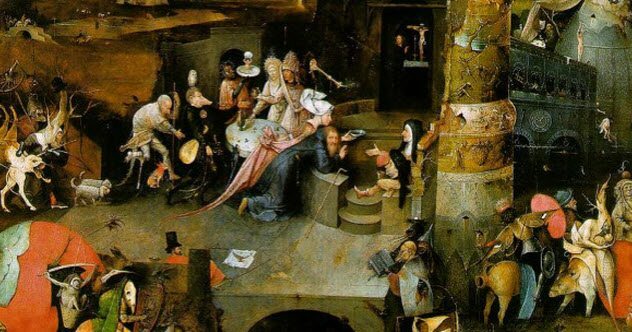 St. Anthony was born to wealthy parents. But he decided to give up all he had and retire into the desert to live a life of holy contemplation. 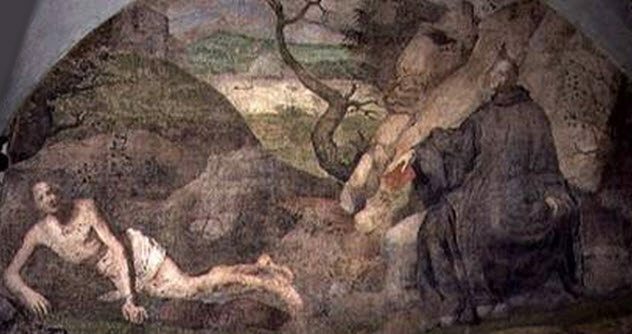 The Devil was not going to let St. Anthony escape the temptations of the world. The Devil plagued the would-be saint with laziness, boredom, and the tempting images of women. St. Anthony battled these with evermore intense prayer. Annoyed by how resistant his opponent was to mental attacks, the Devil turned to physically battering Anthony with a regiment of lesser demons until he fell unconscious. St. Anthony was rescued by a friend and returned to health before seeking seclusion again. The Devil saw that physical threats would not work, so he sent legions of ghouls in the shape of wild beasts that made as if to tear the saint apart. He hoped terror would drive Anthony back into the city. 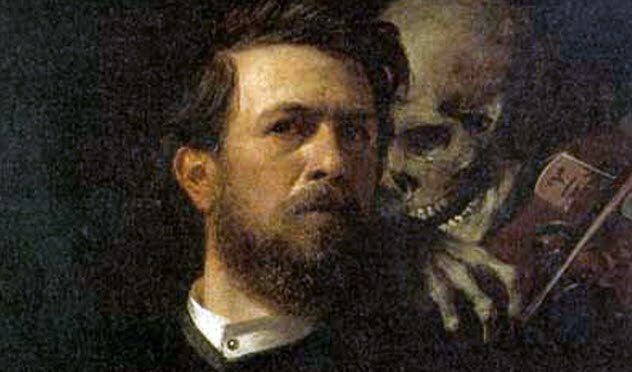 St. Anthony merely laughed at the Devil and his scores of scary ghosts. “If any of you have any authority over me, only one would have been sufficient to fight me,” declared St. Anthony. Fiction is always quick to point out that a deal with the Devil is usually a terrible idea. Not all folktales bear this out, however. Jack O’Kent is one man who always seemed to come out on top in his dealings with Beelzebub. Apparently, traveling magician Jack O’Kent made several diabolical deals. In one adventure, he offered the Devil a share of a herd of pigs. To decide who got which pigs, they split the animals according to their tails. Jack got the pigs with curly tails, and the Devil took those with straight tails. Happy with the division, the Devil waited for his delivery, only to find that Jack had marched the pigs through a stream whose cold water twisted all the pigs’ tails. In another story, the Devil wanted half of Jack’s crop of wheat. Jack paid his debt with the bottom half, leaving the grain for himself. Enraged, the Devil demanded the top half of next year’s crop. Jack promptly planted turnips. After years of being beaten, the Devil had had enough. He swore to take Jack to hell “whether he was buried inside or outside the church.” Jack had the last laugh by being bricked up in the wall of the church so as to be neither inside nor outside of it. The knight Gerard was a man especially devoted to the worship of St. Thomas. Gerard would refuse nothing to anyone who came to his door and begged for a favor in that saint’s name. Despite Gerard’s holy ways, God gave the Devil permission to toy with Gerard. This might sound perverse on the part of the Almighty, but the Book of Job in the Bible tells a similar tale. The Devil arrived at Gerard’s door in the form of a beggar and asked for a cloak in the name of St. Thomas. Gerard gave the man his own expensive cloak. 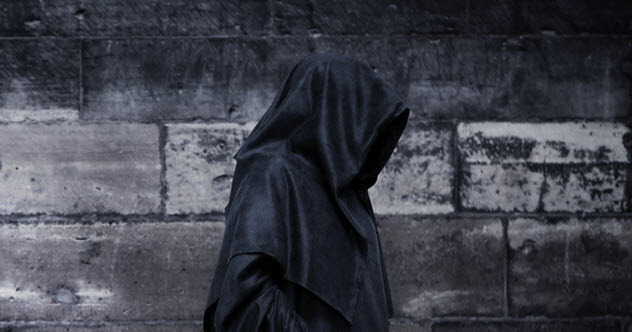 The Devil and the cloak disappeared, leading Gerard’s wife to scold him for his stupidity in giving away a costly garment to a beggar. Instead of making the knight give up his trust in his patron saint, Gerard simply trusted that everything would be fine. “Do not be disturbed, St. Thomas will certainly make good this loss to us,” said Gerard. The response of his long-suffering wife is not recorded. St. Benedict also was a rich young man who gave away the trappings of his former life for one of religious austerity. Benedict withdrew from Rome to a secluded cave. As with other attempts to escape the world, the Devil was not content to let Benedict escape his clutches. The Devil’s first, somewhat baffling attempt was to visit Benedict in the form of a blackbird and flutter annoyingly close to his face. Benedict sent him flying with a benediction. The Devil’s next try was more subtle. He took the form of a beautiful lady to whom Benedict had long been attracted. The vision was so alluring that Benedict nearly left his cave to chase the delights of the flesh. However, he saved his soul when he flung himself into a patch of thorn bushes and rolled around to mortify his flesh. This seems to have worked even better than a cold shower, and Benedict went on to become the father of Western Monasticism. St. Catherine is recognized by Catholics as one of the Doctors of the Church—saints important to the formation of the theology of the Catholic Church. To reach this position, she first had to marry Christ and battle her way past the Devil. Catherine formed her marriage with Christ to avoid the suitors that her family was preparing for her. 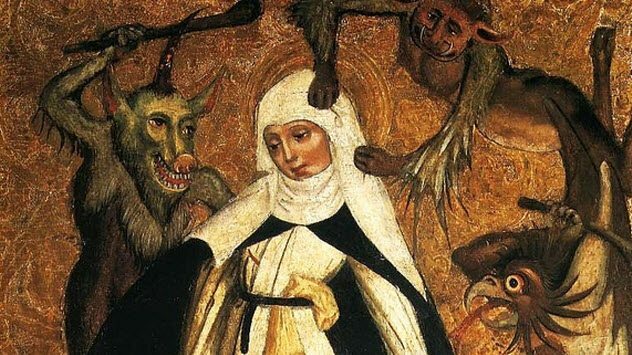 The Devil was not content to let Catherine have an easy ride to sainthood. He overwhelmed her with disgusting images and carnal hallucinations which lasted for days. During this time, she could not communicate with God. Eventually, the visions were dispelled by Catherine’s prayers. This idea is presumably cold comfort for those sinners roasting eternally in hell. Medieval churches were often richly decorated with paintings to help those who could not understand Latin to follow the service. A common motif was a “Doom painting”—one showing the Last Judgment with the suffering of sinners in hell. 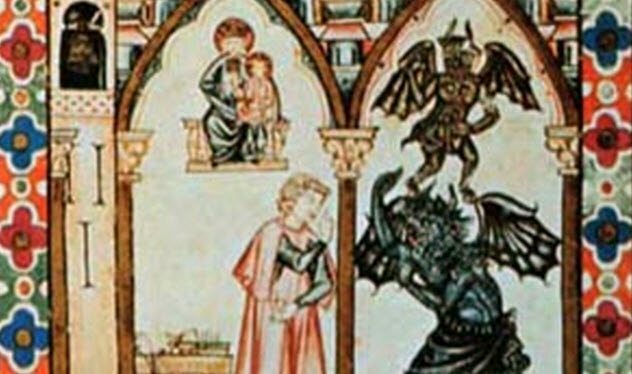 One medieval story shows just what the Devil thought of most of his depictions. A man who had made his living as a sculptor and painter joined the abbey at Auxerre in France. A bare patch of wall had been left on the building because the abbey had no monks skilled enough to fill it. Quickly, this new monk set to work creating images of Jesus and the Virgin Mary. He also depicted the delights of paradise. Each of these he made as glorious as his skill would allow. Then he turned to his depiction of hell as a warning to the impious. Here, he painted a Devil as ugly as his imagination dared create. The Devil was stung by this assault on his pride and appeared to the monk. He suggested that the monk had spoiled all his previous work by adding something so ugly to it. Why not paint the Devil as a handsome young man? But the monk was happy that his Devil was so hideous. The Devil became angry, revealed himself, and knocked the monk from the ladder on which he was standing. Only the intervention of the Virgin saved the monk. St. Wolfgang decided to build a church. To determine where to construct it, he climbed a mountain, threw an axe, and watched where it landed. Town planning was a much more exciting activity in the past. Once he reached the spot where the axe was, he decided he needed a little help with the construction. 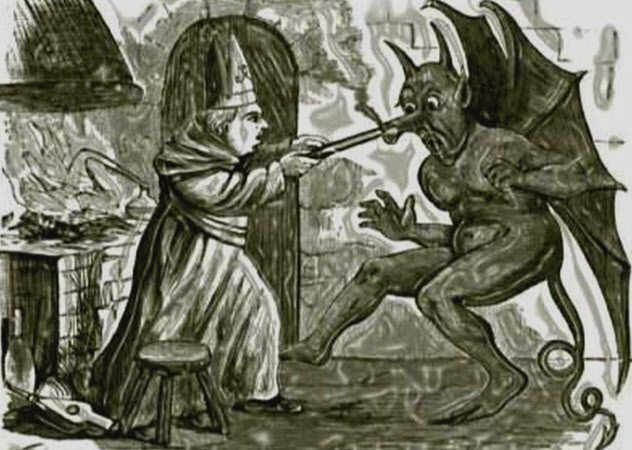 The Devil appeared to St. Wolfgang and offered his assistance. The price: The Devil would get to claim the soul of the first living thing that entered the church he helped build. Wolfgang agreed. Although the church looked beautiful, locals were able to tell that it had been made by the Devil because none of the lines were regular or matching. The Devil held Wolfgang to his bargain. Wolfgang began to fear the price to which he had agreed. Just then, a wolf chased by hunters ran toward the church. Wolfgang threw open the door, and the wolf raced in. Wolfgang pointed to the wolf and told the Devil to take the soul of the first living thing to enter the church. Wolfgang’s tricky use of sticking to the letter of a deal is a common one in stories about bargains with the Devil. Other tales also have the Devil building something. 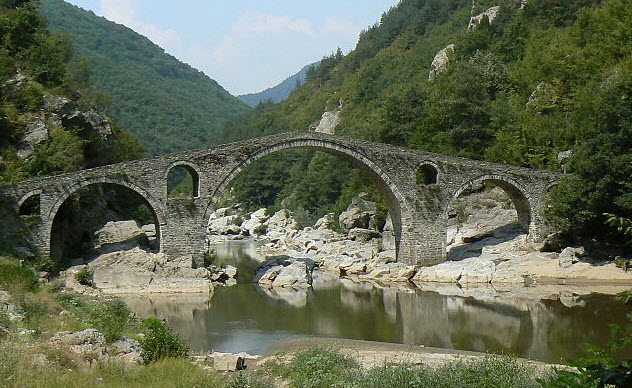 All across Europe can be found bridges that are said to have been made by the Devil. Many of the Devil bridges have stories of animal trickery associated with them. The legend will go something like this. Locals need a bridge to cross a dangerous river or gorge but find it is beyond them. They summon the Devil to ask for help. He agrees—for the price of the soul of the first thing to cross it. The locals accept, and the Devil makes a bridge. They then drive an animal (dog, goat, or chicken—doesn’t seem to matter) across, and the Devil leaves without his intended prize. There are variations, however. In some tales, the Devil wants the architect’s soul. When he is tricked out of that, he refuses to allow the bridge to be completed. One block is always missing, and the Devil will steal any block that is put in its place. St. Dunstan was an adviser to one of England’s Anglo-Saxon kings but found himself accused of witchcraft and banished from court. He took up the holy life of a hermit, supporting himself by playing the harp and working as a blacksmith. As ever, the Devil was not going to allow someone to live a simple, sacred life. One day while Dunstan was working in his smithy, the Devil took the form of a young woman and danced to tempt Dunstan to sin. He ignored the intruder and continued with his work. The Devil’s dance became wilder, and his skirts lifted as he twirled, revealing the hooves beneath. Dunstan grasped the Devil’s nose with the red-hot tongs from his forge and drove him out. Dunstan forced the Devil to promise never to trouble him again by hammering horseshoes into the Devil’s hooves. The red, sulfurous water of the spring at Tunbridge Wells is supposed to have been spoiled by the Devil quenching his burned nose in it. Read more disturbing tales about the Devil on 10 Marks Supposedly Left On Earth By The Devil and 10 Cursed Souls Who Made Deals With The Devil.